talking to local stations at evenings. Later on i realised that i was able to reach to foreign countries like <?xml:namespace prefix = st1 ns = "urn:schemas-microsoft-com:office:smarttags" />England, Ireland, Serbia etc. This made me more interested in radio communications. My main intersest so far is to collect sqares in VHF and UHF but a growing interest is HF. 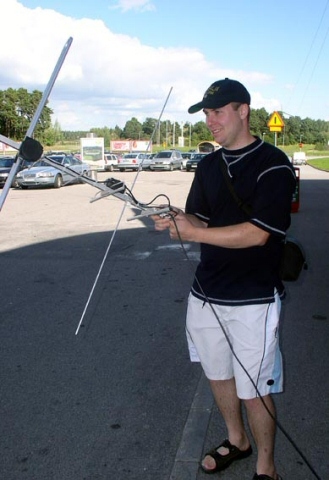 I also do participate in the Nordic Activity Contests occasionally (VHF UHF). I also like satellite activities Amateure Television (ATV) computers etc. Me satellite hunting AO-51 portable. 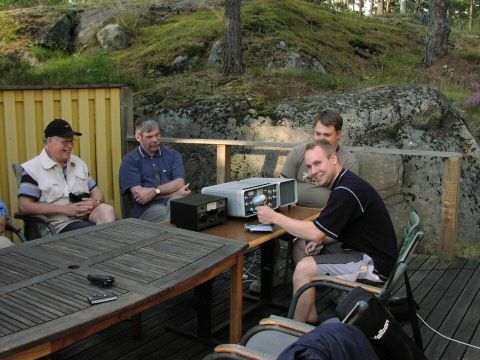 Me and some friends from the local radioclub at a startup meeting after summer 2005?